Are you in full indulgence mode now? If so, you will LOVE these Salted Caramel Gooey Bars. They have a soft, buttery crust with a salted caramel filling. So gooey that you may need to eat these bars with a fork. I love all things salted caramel, don’t you? If you need more dessert ideas, you can check out these healthy desserts with 5 ingredients or less. A buttery bar with a gooey salted caramel filling. 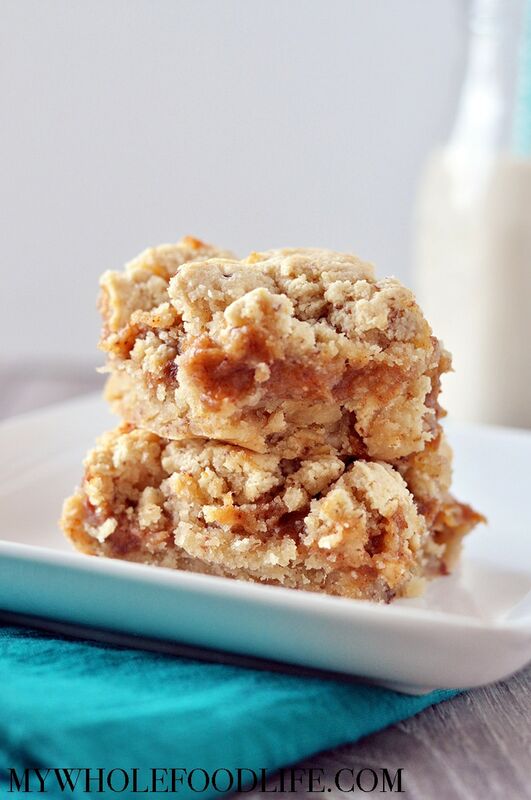 You have GOT to try this decadent bar recipe! Vegan, gluten free and paleo! Drain the dates and add them to a blender with the almond butter. Blend for a minute. If the mixture is not smooth enough, add a few tablespoons of water. Once the mixture has reached a desired caramel-like consistency, add the sea salt, mix and set aside. In a medium mixing bowl , add the almond flour and baking powder. Mix together. In a large mixing bowl , add the softened coconut butter and maple syrup. Cream together for 1-2 minutes. Then add the flax egg and vanilla and mix. Lastly, add the dry mixture to the wet and blend until the batter comes together. If the batter looks a little dry, you can add 1 T of almond milk. Line an baking dish with parchment paper. Spoon 1/2 the bar mixture into the baking sheet and press flat. Spread the caramel mixture on top of that layer. Add the remaining bar mixture over the top. Let completely cool before trying to cut into bars. Keep this stored in the fridge. Enjoy!! This bar is on the softer side and best eaten with a fork. It would be delicious with ice cream! Do you think raw milk will work instead of almond milk? I dried out the almond meal from making milk into fine, flour-like consistency. Can I use that for the flour in this recipe? Unfortunately, almond pulp does not always work in baking. I use it in energy bites, or when I want to add a extra protein to recipes. It would be best to use almond flour for this. I love this recipe. It's simple and sooooo delicious! Thank you for sharing your talent and love of food with us! Could I use white flour? These look amazing! Hey, it's me, "dateless" girl. Any ideas for how I could make the caramel without dates? Made these. LOVE THEM. Will certainly make again!!!! Yay!!! So glad you liked them Yvonne! What size baking dish?? I don't see the size?